Squash will have better success in places with short growing seasons if the seeds begin life indoors. The seeds need to be planted in pots that are large enough to hold the root structure of the plant. Most squash will put forth a large root system while there are only two primary leaves on the plant. Typically the squash seeds are started indoors four weeks prior to outdoor planting. The soil must be at least 60 degrees Fahrenheit for a successful transplant. Mix a solution of 1 cup bleach and 3 gallons clean water in the 5-gallon bucket. Place the 6-inch plastic pots in the solution for approximately 30 minutes. Remove the pots from the bleach water. Rinse the pots with clean water. Allow them to dry in a sunny location. Fill the clean and dry plastic 6-inch pots 3/4 full with the potting soil. Insert three squash seeds into the potting soil, approximately 3/4-inch deep. Press the soil down gently with your hand. Set the pot in an area where water draining from the pot is not a problem. Fill the pot with water. Allow the water to drain from the pot through the drainage holes. Fill the pot once more with water and allow to drain. Place the pot in a sunny location. Keep the soil moist by adding no more than 1/2 cup water to the pot. Depending on the type of squash and its species, the seeds should begin to germinate in four to seven days. Thin the plants to the two strongest plants from the three that have germinated. It may seem tough to do, but three plants' root systems will compete too much in the small container. Plant the squash plants outdoors when the soil temperature exceeds 60 degrees Fahrenheit. The location for the plants must be in full sun, with well-drained soil. Squash grows best in a hill of well-rotted manure and compost. Use a high-quality potting soil that contains high levels of organic fertilizer and compost. Chemical fertilizers can be applied, once a week, after the plants have emerged for two weeks. 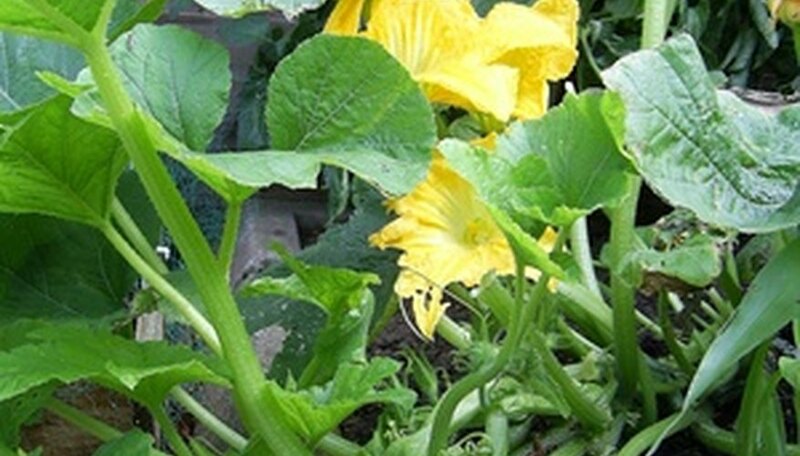 Squash can be delicate plants to transplant from small containers. Use as large of a seed-starting pot as possible. Dig the holes in the garden prior to bringing the squash plants to the garden area.